It IS possible to love something - and snark at it! Tony Goldmark is the aforementioned Some Jerk. He loves theme parks, but it is a love with eyes wide open. 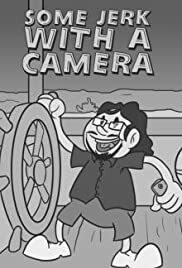 Through some sophisticated filming with his friends, he's able to show theme park attractions and shows in detail, without getting thrown out. (Hint: he intentionally NEVER says anything upsetting or contemptuous in the parks. Anything like that gets added in post. Watch the episodes closely to see how this works.) More than anything else, he observes how corporate decisions affect what you see and experience in theme parks. This is most apparent in his two-part review of the Captain EO attraction, showing how Michael Jackson was suddenly in favor, then out, then back in favor when he died. My personal favorite is his review of the revised Star Tours attraction. Every mixed feeling or questionable decision of Lucasfilm and Disney gets its due...with his soliloquy about a certain floppy-eared resident of the planet Naboo his greatest performance of all. He's wise enough not to take himself too seriously. But, no matter how pointedly he critiques attractions, he cares deeply for the theme park experience. He knows Disney and Universal history, enough so that he can illustrate his reviews with appropriate (and deliberately inappropriate) film clips and music. If you've ever attended a park, and especially if you've ever worked at one, you'll love these reviews. A word about content; Mr. Goldmark does get scatological at times. These reviews are not for little children. Teenage and above will find them okay, at least teenagers not raised in the more backwards parts of our nation.